Filled with some of the finest products we have to offer, our hampers have been carefully selected to suit all occasions and celebrations. Filled with some of the finest products we have to offer, our hampers have been carefully selected to suit all occasions and celebrations. 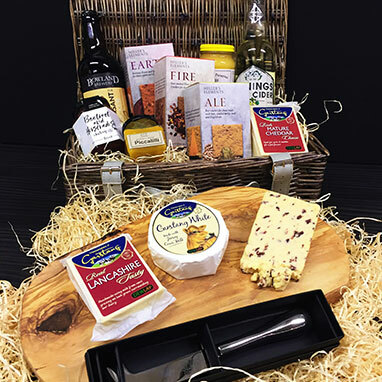 With cheese taking the main stage, we have scoured our suppliers to bring you the complete food hamper package including chutneys, wines and accessories. Also, please be aware, where an item is currently unavailable we reserve the right to replace it with a similar product. 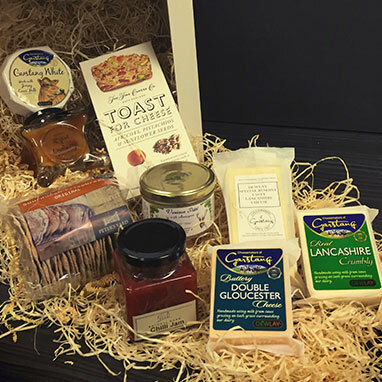 For a taste of home there’s no better way to treat someone who loves Lancashire cheese than with this Lancashire treat box. 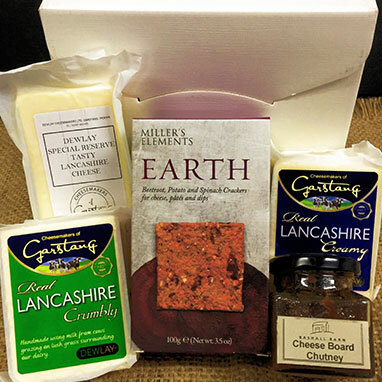 Complete with a trio of Lancashire cheeses, it’s paired alongside a cheeseboard chutney and Millers Earth Crackers. Need a gift for a wedding or anniversary, or simply want to treat the one you love? 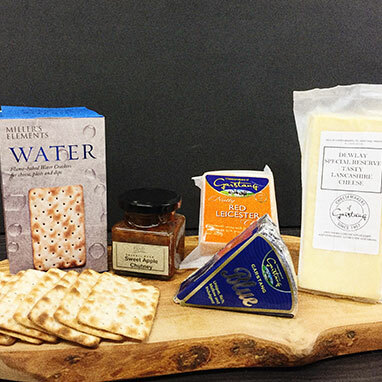 This gift box can set the mood with enough cheese and accompaniments to share over candlelight or to take on a picnic. 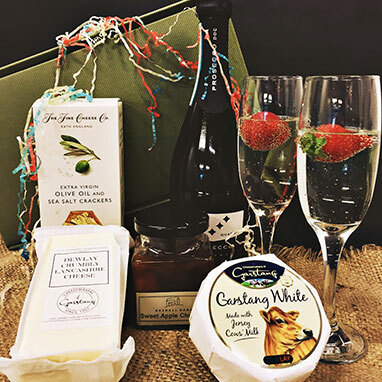 We all know that bubbles are a great way of celebrating, but to take it to the next level, we have paired a bottle of bubbles with two show stopping cheeses, as well as a sweet apple chutney and flavoured crackers. This is all presented in a delightful presentation box. The perfect birthday gift, this cheeseboard comes ready to serve with a range of Dewlay’s favourite cheeses, as well as a chutney and crackers. Not only that, but it is presented on an olive wood cheeseboard, so all you need to do is take it out of the box and place it on the table. 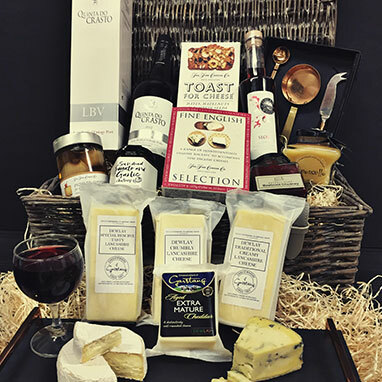 Put the dessert to one side and move straight to the cheese course with this specially created gift box, packed full of cheese favourites and accompaniments. This is ideal for parties and get-togethers. This gift box is packed to the rafters with delectable treats and offerings; from Prosecco and chutneys to larder staples, including our own Whey Creamy Butter and Cartmell’s Chilli Damson Ketchup. As a keepsake, our Ready Made Feast comes with a wine bottle stopper. For people who love their food and live in their kitchen, this hamper hits the spot as it’s packed full of food and drink as well as kitchenware including a cheese knife and cheeseboard. With layers of gifts on offer, this hamper comes beautifully presented in our traditional wicker. 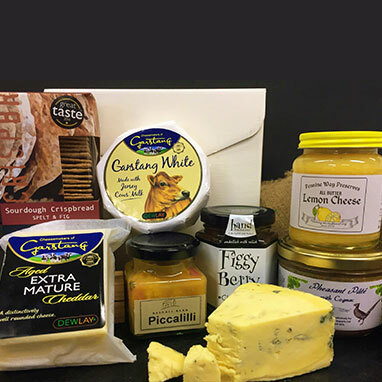 Packed to please, this deluxe hamper is full of delightful provisions including English pickled onions and honey mustard, and cheeses including blue, white and matures. To complement, the hamper features an English Sloe Liquor, Port and a charming copper slate tray and accompanying copper accessory set. 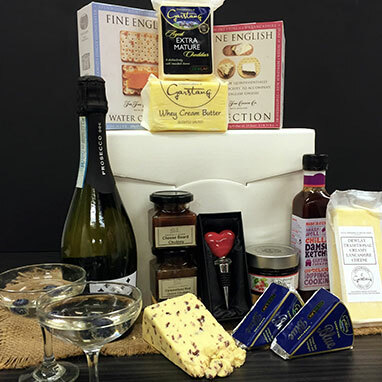 This hamper comes beautifully presented in our traditional wicker hamper.